Why You Should Use Geranium Essential Oil! Are you looking for new, beneficial essential oils to add to your home supply? Then you should use geranium essential oil! Geranium essential oils uses are amazing! Geranium is the essential oil that you never knew you needed! Isn’t the Geranium flower beautiful?! And trust me, the fragrance is just as wonderful! It is also good for so many things, which is why I include it in my Essential Oil First Aid Kit. This might not seem important, but trust me, it is! Some essential oils have lots of different species, and some of these species can be harmful. So it is important when purchasing an essential oil to make sure that you read the full scientific name so that you know what you are getting. For example, eucalyptus essential oil is an oil that I use on my kids for respiratory concerns and immune support. But some varieties of eucalyptus essential oil can actually stop a small child’s breathing! We’ll discuss this more when we discuss eucalyptus in a future post! What is Geranium essential oil and where does it come from? The Geranium essential oil that I use and recommend is painstakingly harvested in Madagascar from the wild-crafted leaves and flowering tops of the plant. It is not the same ‘Geranium’ flower that you are used to buying in bouquets and at your local nursery. 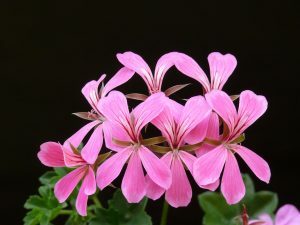 It is from a totally different Geranium plant, as you can tell from the beautiful picture of the Geranium flower here. Geranium is considered ‘the poor man’s rose’, as it is not nearly as pricey as rose essential oil, even though it has a floral rose-like scent. It is often used to adulterate rose oil, because it is so close in scent. 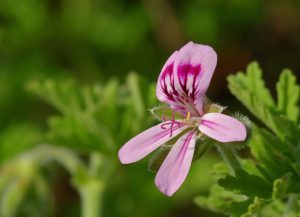 Historically, all parts of the Geranium plant were used by Native Americans to treat various disorders, including diarrhea, excessive bleeding, and inflammatory disorders. It has also been used in perfumery and soap making. According to the Be Young Total Health Desk Reference, geranium essential oil has a profound impact on several body systems, most notably the integumentary system (the skin). Also, Be Young cites recent research that has focused on the antimicrobial properties of geranium. In limited human research, geranium oil has been studied as a mosquito repellant. Dr. Kurt Schnaubelt, Ph.D. in his book The Healing Intelligence of Essential Oils, recommends Geranium as an excellent essential oil to use in the shower! He specifically lists geranium essential oil, among other oils, as a great essential oil for the shower, stating that it is very nurturing. If you would like to see the other essential oils that he recommends for shower use you can find them in his book ‘The Healing Intelligence of Essential Oils‘. Dr. Schnaubelt also lists recipes for various infections that include geranium essential oil. For example, he lists a respiratory blend in addition to others. 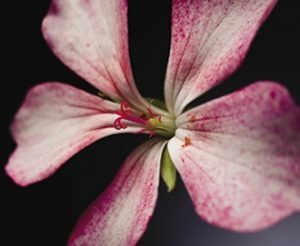 Jennifer Pressimone discusses geranium in her courses ‘Introduction to Holistic Aromatherapy’ and ‘Specialized Holistic Aromatherapy’. 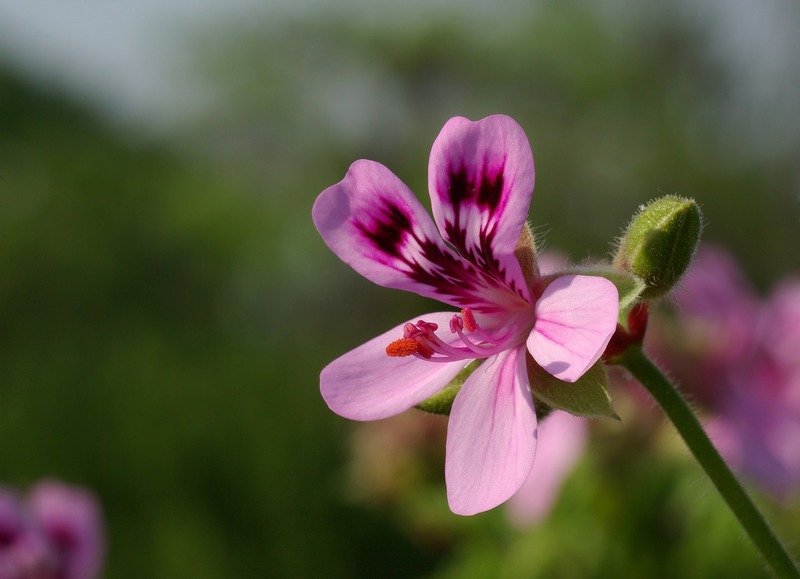 She says that geranium has historically been used to assist the body in handling anxiety, stress, hormone balancing, grief, as an insect repellent, a diuretic and in skin care, etc. If you would like to use Geranium Essential Oil for emotions in children (as well as adults:), then please check out my FREE Essential Oil Chart! You can read all about it here in my Essential Oil Roll-Ons for Kid’s Emotions Post. This post gives you access to my FREE chart that includes recipes to create your own roll-ons for your children, as well as yourself. These blends are color coordinated, which allows children to use the blends themselves based upon the emotions that they are experiencing. You can also subscribe to receive your free chart below! When my fourth child was just a baby, I accidentally cut her finger while attempting to cut her finger nails. I felt like such a horrible mother! And truth be told I probably cried more than she did! But, as an Aromatherapist my mind always races to which Essential Oil I should use in times of crisis! I quickly got out my Geranium Essential Oil and applied it to her finger. Initially the bleeding slightly increased, as the oil caused the body to flush the wound of debris or bacteria, but then the bleeding quickly stopped! You can read more about why I keep Geranium in my First Aid Kit here! And, last but not least, I use Geranium in several products that I create: My Insect Repellent, Moisturizing Face Blend, Pampered Feet Massage Oil, and my Adrenal Support. A contraindication is a medical reason for not using something. In this case it is a medical reason for why you should not use Geranium Essential Oil. Pregnancy and breastfeeding: Geranium Oil is safe for pregnant and breastfeeding women in small amounts. Avoid long-term use if you have a history of estrogen-dependent cancers. It is not know if this oil interacts with any medicines. You also want to make sure that you are using a good quality Geranium essential oil. As an Aromatherapist I would never recommend buying an essential oil at a local store, because I can almost guarantee you that it is not a pure oil. There are no government regulations on essential oils, so an oil can be diluted by up to 50% and still be marketed as a pure oil. 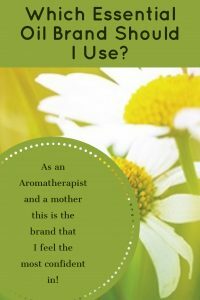 Which brand of essential oils should I use? Make sure that you know and trust your source! If you have a brand that you feel confident in you can use that. 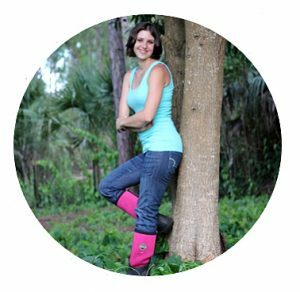 If you aren’t sure about where to get geranium essential oil, or if you would like to check out the brand that I use, you can find it on my business website Healing Blends For Life. 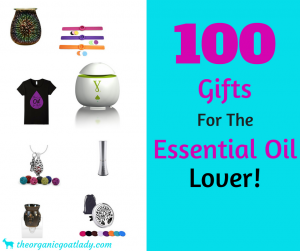 Where to buy Geranium Essential Oil at discounted prices! If you are interested in learning how you can buy my preferred brand of essential oils at a discounted price check out my Essential Oil page! I hope you enjoy Geranium Essential Oil! Have you used Geranium Essential Oil before? What did you like about it? Did it help you? Please share your experience in the comments below! I truly appreciate your participation! 1.Why You Should Use Frankincense Essential Oil! 2.Why You Should Use Dill Essential Oil! 3.Why You Should Use Myrrh Essential Oil! 4.Why You Should Use Roman Chamomile Essential Oil! 5.Why You Should Use Clove Essential Oil! 6.Why You Should Use Birch Essential Oil! 7.Why You Should Use Cypress Essential Oil! 8.Why You Should Use Helichrysum Essential Oil! 9.Why You Should Use Turmeric Essential Oil! 10.Why You Should Use Ginger Essential Oil! 11.Why You Should Use Nutmeg Essential Oil! The information provided on this site is for educational purposes only. I do not prescribe, diagnose or treat any medical conditions. Please consult your health care provider before implementing any of the information provided on this site. The information provided on this site is completely my own opinion and does not reflect the opinions or beliefs of any other entity. Any statements or claims regarding health benefits of foods, supplements or essential oils listed on this site have not been evaluated by the Food and Drug Administration and are not intended to treat, cure or prevent any disease. For more information please read my full disclaimer page here.